About | TSO Armor & Training, Inc.
TSO delivers worldwide maritime, security, law enforcement, antiterrorism and Explosive Ordnance (EOD) training, and consulting for the private, commercial and government sectors. Our services range from the “school house” instructional level (introductory, fundamental and basic) to the operational unit level (sustainment and advanced training). TSO is recognized as a Women Owned Small Business. TSO is owned and managed by Jody Wilkinson and Scott Vickery, a retired US Coast Guard veteran. We employ full-time personnel and additional contract instructors for surge and replacement requirements. The founders of TSO are experts in combat, antiterrorism and security force operations, specializing in tactical training and equipment load out. Our staff maintains recognized federal and/or state instructor certifications. We offer our clients a unique blend of operational expertise and a practical, common-sense approach for mission-focused training solutions. TSO maintains a rigorous business discipline and delivers exceptional value to the U.S. Government. We enjoy the success that has come from multiple contract awards, including the US Navy, US Coast Guard (USCG), Marine Corps (USMC), and US Army (USA). We have an exceptional track record with the U.S. Government for our high-impact, high-quality tactical maritime training services. 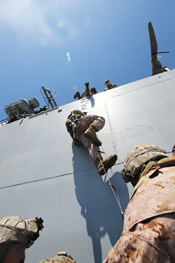 Staffed by former Navy, Marine Corps, Army and Air Force personnel, including Naval Special Warfare SEALs and Special Warfare Combatant-craft Crewmen (SWCC), we are a well-established industry leader in antiterrorism/force protection planning, security force training, and mission performance validation. Our proactive management approach reflects significant real-world naval leadership and knowledge. TSO provides tactical training services to Department of Defense (DOD), Department of Homeland Security (DHS), federal, state, and local law enforcement agencies, and corrections communities. We recognize that every client’s needs are different, and we carefully adapt our solutions to meet each one.